We have been anxious to show the kinds of wildlife that live on our protected lands. With the help of a grant from the Dyke and Phyllis Heinze Conservation Fund of the Mount Pleasant Area Community Foundation, we were able to purchase three game cameras and ancillary equipment, and we rushed to put them out, initially two at the Hall’s Lake Natural Area, specifically one on the Neely Preserve and one on the Kabana Preserve, and the third one at the Sylvan Solace Preserve, closer to Mount Pleasant. We are already having a ball. As might be expected, we are seeing plenty of White-tailed Deer and raccoons. 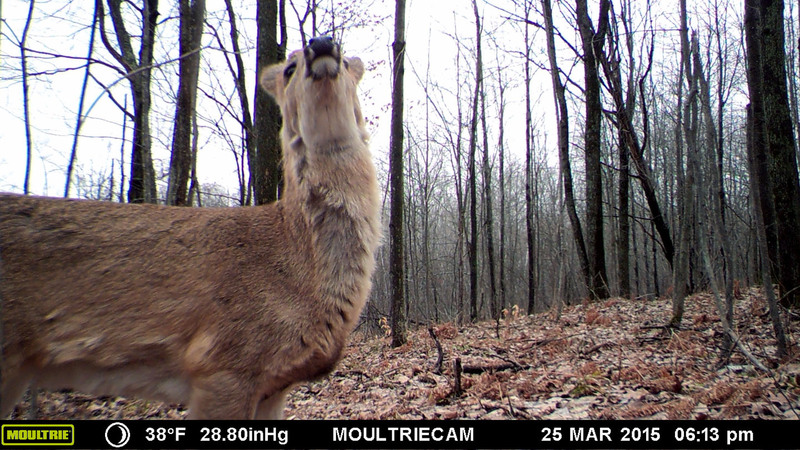 We couldn’t help but laugh at the inquisitive yearling deer that stuck its face right up to the camera shortly after we placed it at the Neely Preserve. We have caught deer in other amusing poses as well. So far, in addition to the deer and raccoons, we have seen squirrels, opossum (just a bare tail hanging over an old cedar limb), wild turkeys, beaver, and one uncommon mammal that we were really hoping we would see, a bobcat. 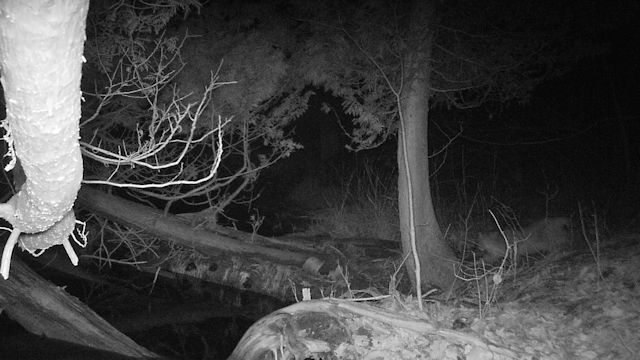 We caught three ghostly infrared images of a bobcat slipping along the river’s edge at Sylvan Solace. Tantalizing, if a bit fuzzy. We certainly hope this doesn’t cause anyone to be concerned about safety. Bobcats are shy creatures, mostly nocturnal or active at dawn and dusk. About twice the size of a domestic house cat, they have long legs, large paws, and tufted ears similar to those of their larger relative, the Canada lynx. Most bobcats are brown or brownish red with a white underbelly and short, black-tipped tail. The cat is named for its tail, which appears to be cut or “bobbed.” Fierce hunters, bobcats can kill prey much bigger than themselves, but usually eat rabbits, birds, mice, squirrels, and other smaller game. They are probably more common than they seem. Because of their shy nature and the typical hours they keep, they aren’t often seen. 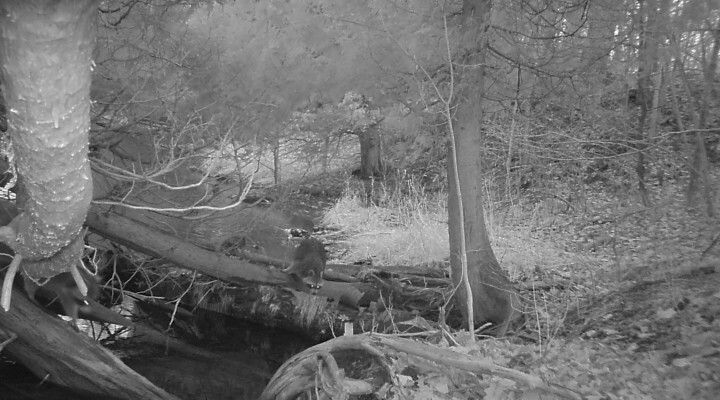 But with the new 24-hour eyes of our game cameras, stay tuned. We hope to bring you better pictures of the bobcat and several other less-seen animals that we believe are out there. And who really gets tired of seeing deer and squirrels, especially in their natural habitat, and not in your yard or garden?